Ingram Content Group is the world's largest wholesaler of print and electronic books to independent bookstores, bookstore chains, internet retailers, and specialty markets, as well as other wholesalers. They distribute to more than 38,000 retailers, libraries, schools, and distribution partners in 195 counties. Unlike most companies working with self publishing authors, IngramSpark is focused just on the worldwide distribution of books in any format. They do not offer services such as proofreading, editing, typesetting, or design services. If you are in need of those services we would suggest that you use more of an author services company such as CreateSpace or Lulu. Or if you want to leverage the distribution power of IngramSpark you can obtain those services needed online through a variety of other avenues. Ingram has two services designed for publishers: Lightning Source International (LSI) and IngramSpark. Lightning Source is designed for medium and large publishers (with a catalog of 10 or more titles), and until recently it was their only service offering. In 2013 they brought IngramSpark to market targeted at independent publishers. As you might suspect these two services have much in common including the backend and the book product itself. But IngramSpark has a front end designed for individuals with limited publishing experience and is much more user-friendly. Since the majority of authors taking this course are not large publishers, we will focus specifically on the capabilities of IngramSpark. However, the majority of what we present will be appropriate for those who qualify for Lightning Source as well. One of the best ways to discover the various costs and potential revenue a book could produce is to go on to the IngramSpark site and enter the parameters of your planned book into their Publisher Compensation calculator. We have done three sample cookbooks that are essentially identical except that one is in black and white, the second in their Standard color and the third in their premium color. 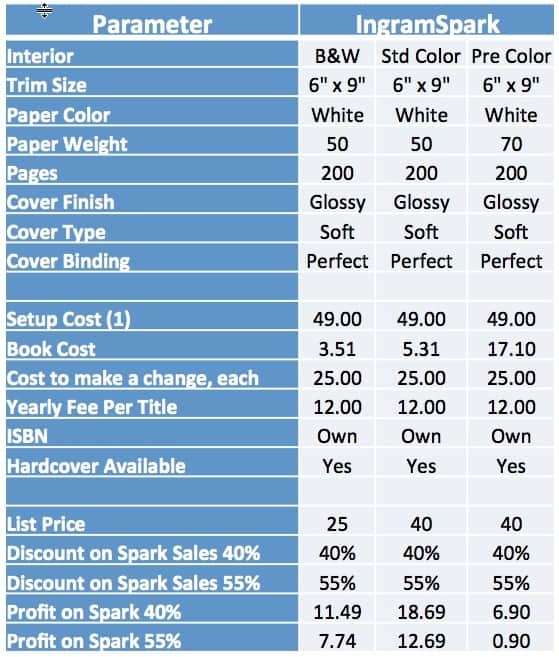 A similar table is available on the CreateSpace review for your comparison of the two publishers. From these samples you can see that there is a $49 setup charge associated with IngramSpark. This will be refunded if you purchase 50 books in the first 60 days after your launch. There is also a $25 fee if you need to make a change to your submission. And finally, there is a yearly $12 Book Market Access fee per title. IngramSpark requires that you own your ISBN number. This is what we recommend but it's going to cost you a minimum of $25 to purchase one. As with all publishers the color versions are significantly more expensive than the B&W one. They recommend for books with high definition photos like a cookbook that you would want to use their Premium color option. With a book cost of more than $17.00 it is difficult to make much profit without increasing the cost of the book significantly. IngramSpark allows you to set your discount at either 40% or 55% depending on where you would like to distribute your books. If you don't plan to aggressively pursue brick and mortar stores then you can choose the 40% discount and make more money with each book sold. The Ingram company focuses the majority of its energy on building the best worldwide distribution network available to authors. If you want to distribute your book beyond the Amazon umbrella then IngramSpark provides the broadest and most profitable distribution network. IngramSpark as an excellent selection of covers and bindings that will meet most authors needs. A lot depends on how you want to measure "turnaround". If you want to measure the time from submittal to the time your book is selling somewhere, then no one is faster than CreateSpace at getting a book in front of the buying public. However, if you are more interested in getting your book available at Barnes & Noble, Books-A-Million, Charter Books and international bookstores, there is no faster way than with IngramSpark's distribution system. The consensus from what we have read and experienced positions IngramSpark as one of the highest quality book publishers. If the quality of your book is your primary priority, then we suggest you go with IngramSpark, especially if you're going premium color. When you publish with IngramSpark your book will show up in their catalog with the line "Publisher=What You Call Yourself" and no one can tell that you're an indie publisher (there are thousands of publisher imprints). This is a very important factor since if you sell your book through the CreateSpace Expanded Distribution Channel they register your book in the Ingram database as "Publisher=CreateSpace". Unfortunately, this is a red flag for bookstores and reviewers that may be interested in your book. Bookstores will shy away from it because they don't want to do business with a giant competitor. In addition it also indicates that it is a self published or indie book which for many has the perception of lower quality. Since Ingram has printing facilities throughout the world shipping to international locations is faster and much more cost-effective than through any other distributor. The combination of the $49 setup fee, a $25 change fee and a $12 yearly access fee make IngramSpark one of the higher cost options. And don't forget you need to own your ISBN. ImgramSpark is a marked improvement over Lightning Source but still has a larger learning curve than most other publishers. Early on IngramSpark had some significant issues with customer support which created a storm of negative reviews. To their credit they have been working hard to improve it but have not reached the level of some of the other more customer friendly publishers. If you choose to sell your IngramSpark book on Amazon you will be treated differently than if you had published it through CreateSpace. Often when purchasing an IngramSpark book on Amazon the buyer may receive a "there will be a delay" message or the book is shown as "out of stock". This is probably because Amazon is unwilling to stock any books from a publisher other than CreateSpace. So if you intend to sell the majority of your books through Amazon IngramSpark is not your best choice. This is one reason why some authors choose to use CreateSpace for Amazon distribution and IngramSpark for everything else.